This past weekend my husband and I hosted a 14th-birthday/graduation party for our twin daughters. The guest list included 15 of my daughters’ friends — all teenage girls. 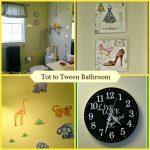 Before the party, I worked to ready our guest bathroom for our guests. Our bathroom also needed a style update, so I headed to my local Target. The first thing I did was stock the bathroom with Quilted Northern toilet paper. I picked up some Quilted Northern Ultra Soft & Strong® Mega Rolls and some Quilted Northern Ultra Plush® Mega Rolls. 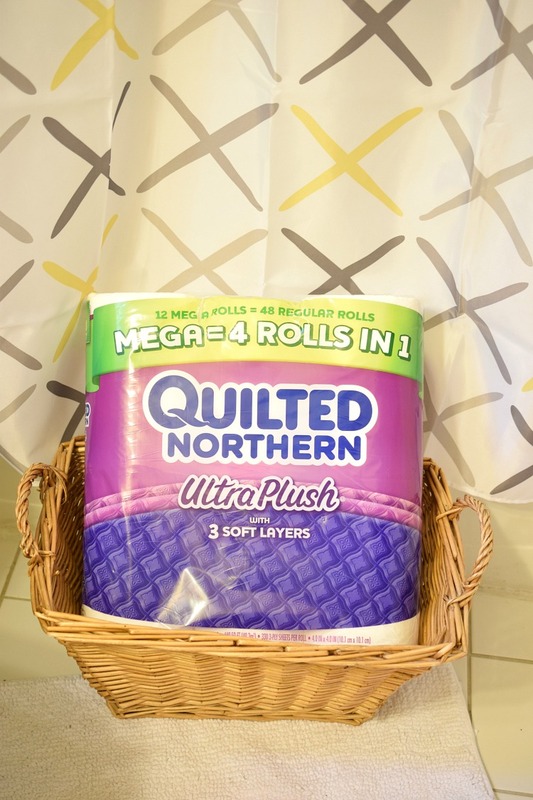 A plus is that Quilted Northern Mega Rolls are 4 regular rolls in one and last longer. I don’t have to worry about my guests running out of toilet paper. I like that the toilet paper is strong, soft and plush. 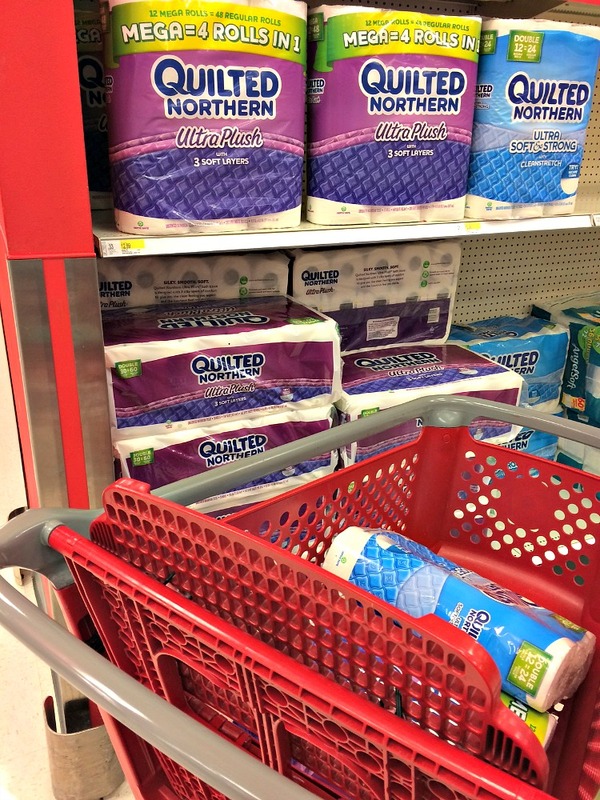 What’s really helpful is that you can save 10% off Quilted Northern Mega Toilet Paper at Target (on the Cartwheel app) from June 20 to July 8. Also, if you buy 3 Packs of Quilted Northern Mega Toilet Paper, you can get a $5 Target Gift Card (valid 6/18-6/24). At Target, I found Quilted Northern in the aisle where toilet paper is sold. 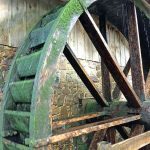 If you vote on your favorite Quilted Northern-inspired bathroom (Daddy Gator, Little Miss Puffytail & Sir Froggy) now until August 1, you get a chance to win a $1,000 Grand Prize or a $250 Target GiftCard! 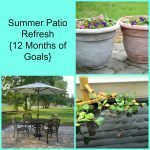 Either of the two could help you refresh your bathroom this summer! I love shopping at Target because when I go there for necessities (like toilet paper) I can also shop for fun things like home decor. When I went to pick up the Quilted Northern toilet paper, I also browsed the bath section for new decor items for my guest bathroom. My favorite Quilted Northern-inspired bathroom is Little Miss Puffytail’s Country Getaway. I love its sweet and simple natural touches like the baskets and the potted plants. I wanted to inject a similar style into our guest bathroom. It was a boring space! I used to keep a simple plastic bottle of liquid soap next to the sink in the guest bathroom. I’ve long wanted to upgrade it to a more stylish soap dispenser, so I picked up two soap dispensers at Target to use for liquid soap and hand lotion. I found a gray bathroom tray for the dispensers. I also found a beautiful all natural weaved wastebasket. 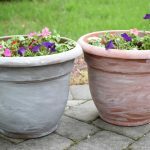 The rustic wastebasket is made from durable water hyacinth, a renewable resource. 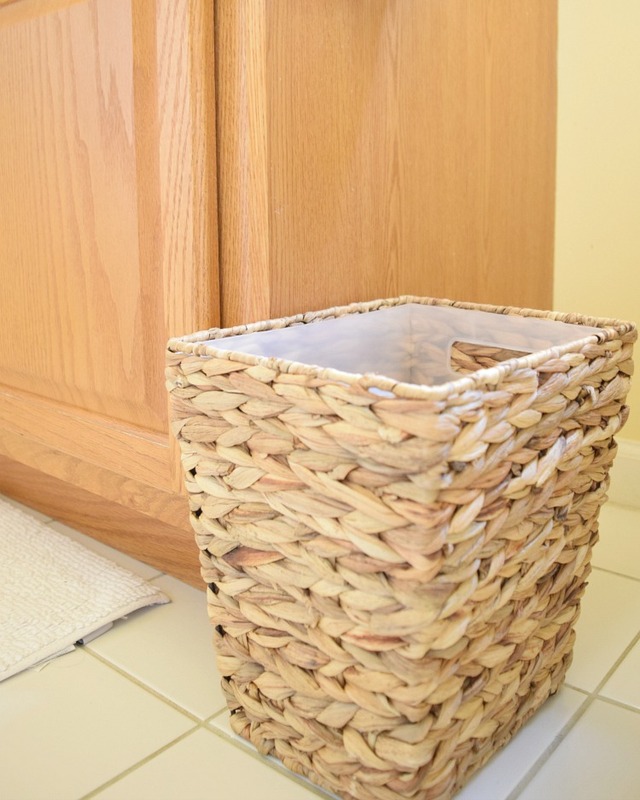 I love that the weaved wastebasket is fitted with a plastic wastebasket, so it’ll be easy to clean. I found many of the new items for my home’s guest bathroom in Target’s home decor area of the store — my favorite section! There I picked up a Smith & Hawken™ boxwood topiary. 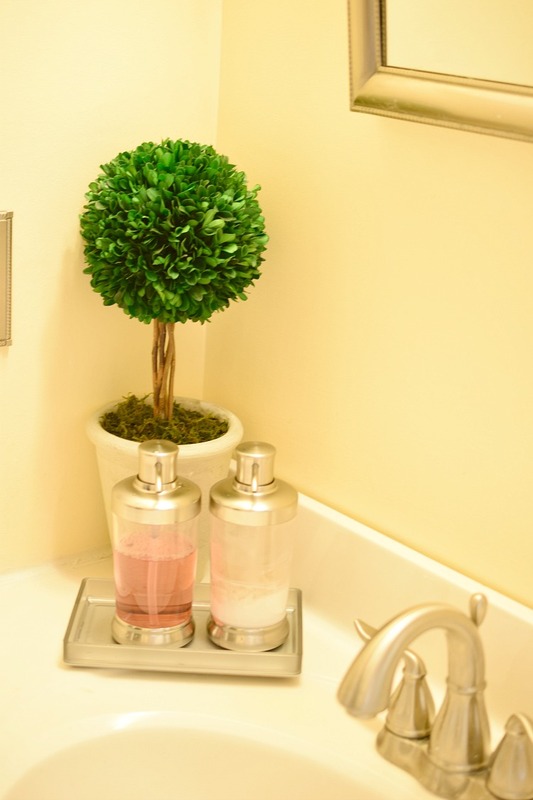 The topiary is made from real boxwood leaves and adds a nice scent to the room. 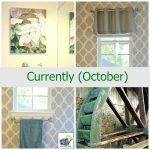 My favorite decor item that I added to the bathroom is the Windham One-Door Storage Cabinet in “Pewter Aqua.” I love the gray/blue color and the pretty glass door. I think the color is a nice contracts to our guest bathroom’s yellow walls. I added two gray baskets to the cabinet to keep things neat and tidy. 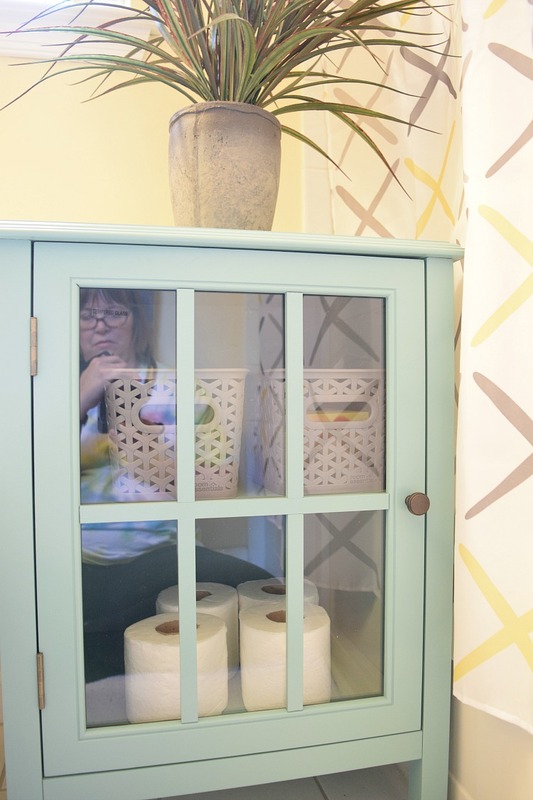 In the cabinet I can store extra toilet paper, tissues, soap, etc., for our guests. 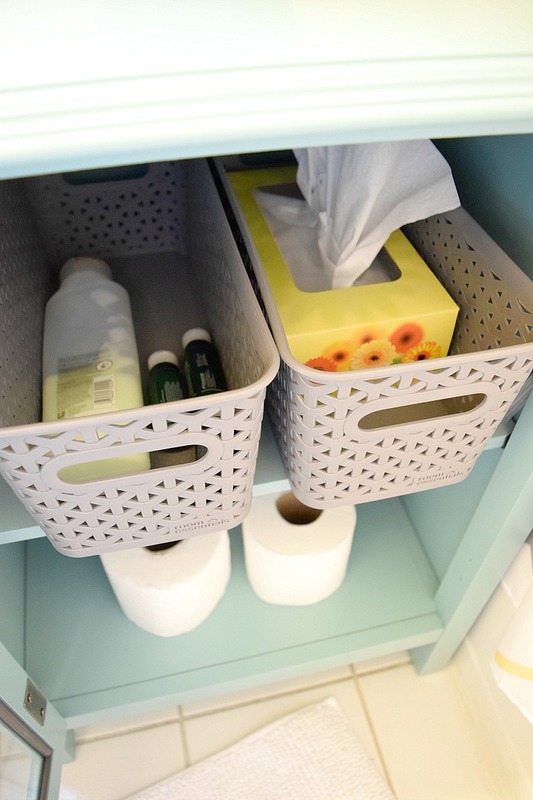 I also keep extra toilet paper in a big basket in the bathroom so my guests can find what they need. 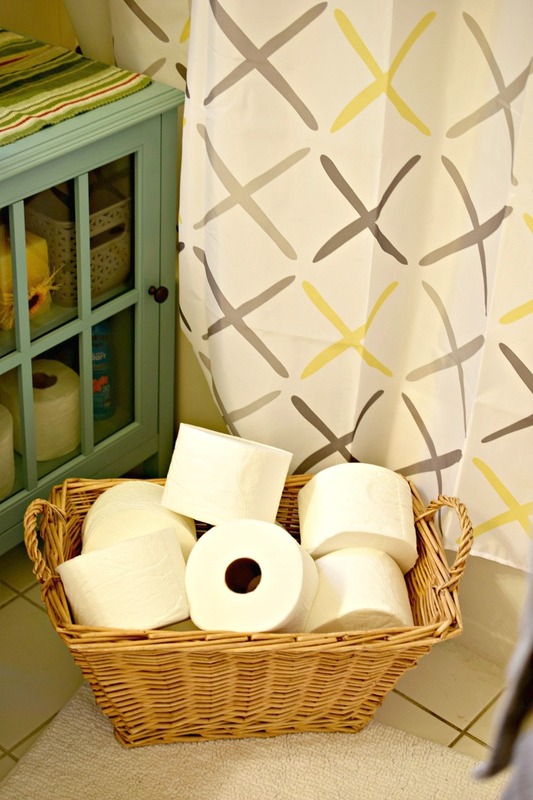 I like storing extra rolls in the basket, because that way, I don’t need to store the toilet paper in our linen closet, which lacks space. 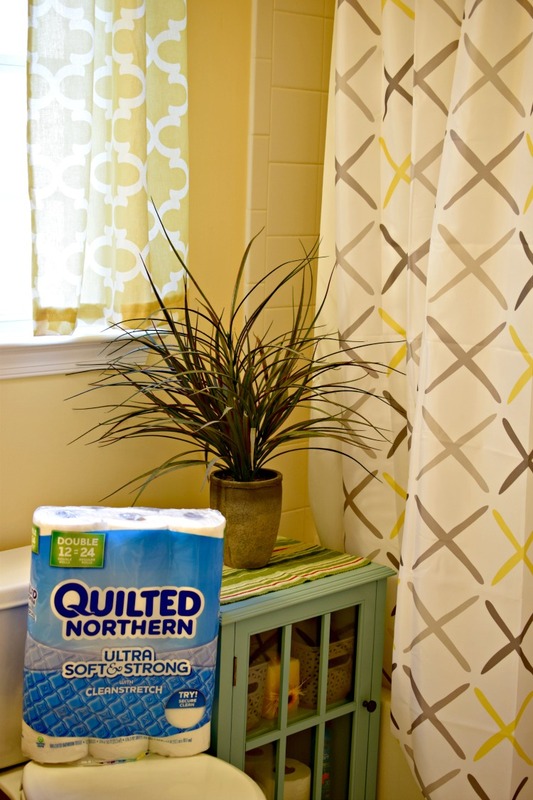 I love the look I created for my bathroom with the help of Quilted Northern and Target! 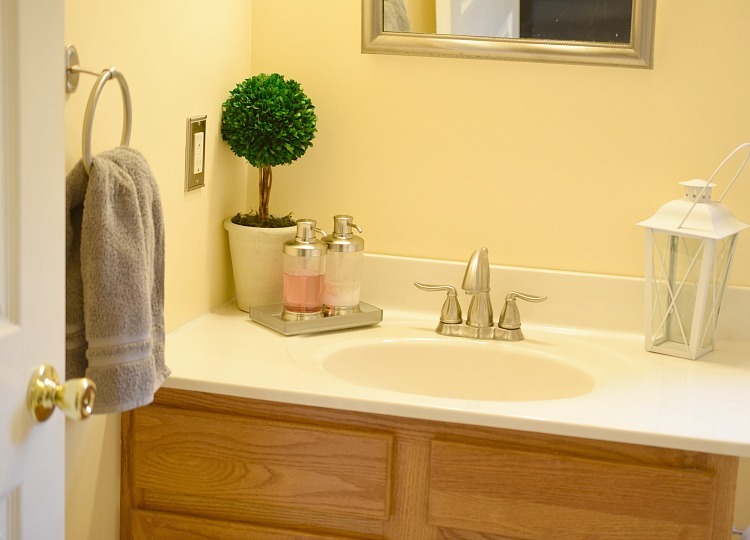 Have you updated a bathroom recently in your home for summer guests and parties? I’d love to hear about it! Your bathroom is so pretty! 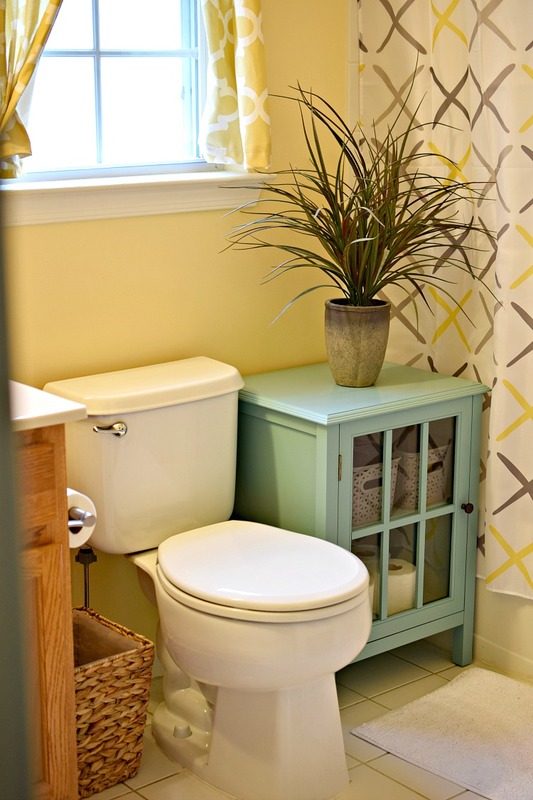 I love that cabinet, the pop of color works so well with the yellow/gray! I always forget to look at Target’s cabinets and other decor items! I also love that you filled that basket with the TP! I feel like I don’t keep enough in our bathroom and we’re always running out! Thanks, Carrie! I LOVE the cabinet, too! I originally wanted this cabinet in gray, but it wasn’t in stock locally. But now I think the pewter gray is a much better option for my bathroom! 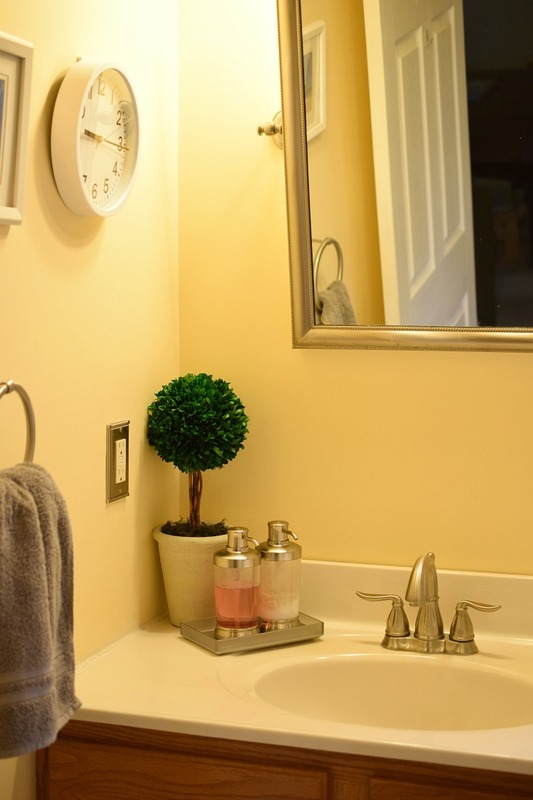 I can’t wait to see how you restyle your bathroom this summer! I like having the basket of TP in the bathroom, too. That way, we usually don’t run out of TP in the bathroom! I love everything you picked- especially the cabinet. Nice way to organize and store! Very clean looking and warm, would do this in my bathroom. The green cabinet is adorable! This is so nice. 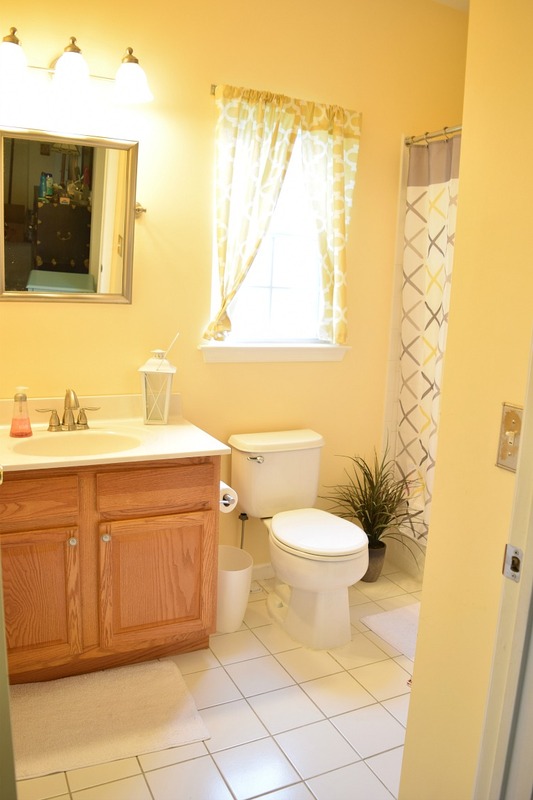 I painted my bathroom a very light yellow, and now want to paint it a little more like this. I love how you decorated it, inspiration! Target has the best Home Decor and I love that cabinet!